Scenario 1: He or she parties all week with friends; drinking alcohol excessively each day, eating terribly and sleeping poorly. These athletes return in rough shape, exhausted and dehydrated. Scenario 2: He or she vacations with family, thus eating and sleeping reasonably well and likely not binge drinking daily. This athlete returns refreshed and recovered. This can be problematic when working in a team environment as some athletes will be ready (both physically and mentally) to continue with the training program while the others certainly will not be. Oftentimes, a coach or trainer will schedule these vacation breaks as planned unloading periods, marking the transition from one phase to another. 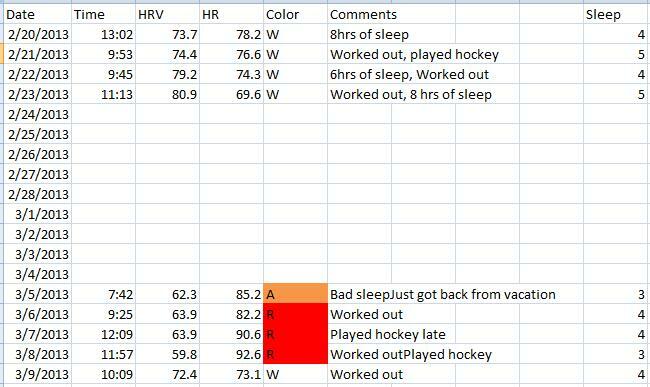 Below is some HRV data from a hockey player I was working with prior to my relocation to Alabama. Preceding his departure for Cuba, his HRV was averaging mid to high 70’s with the odd 80. He then departs for Cuba with some friends for a week or so to enjoy some time off. Upon returning from vacation it becomes quite clear as to what went down (pun intended) during the trip. He did not maintain daily measurements while being away but when he resumes his measurements after returning we can see the consequences of his behavior. It is quite clear that his ability to resume his daily routine is compromised. For his first week back from vacation, I reduced the volume and intensity of his workouts and changed his conditioning work from highly anaerobic/interval based to much more moderate and aerobic based. Even though training loads were reduced, the workouts were still a bit of a struggle to get through for him. We can also see that his perceived sleep quality is also down. The above data set appears to be in direct contrast with that of a football player who vacationed with family (he is much younger than the hockey player). Unfortunately, this athlete has no data prior to vacation as he didn’t have the ithlete hardware yet. His daily measurements commenced on his first morning back from vacation. Based on his average’s following the vacation it would be safe to assume that his trip was hardly stressful. He was able to resume training without the need for any adjustments in intensity or volume. He essentially picked up right where he left off. HRV appears to reflect the nature of the vacation in these two athletes. One athlete spent his vacation partying, drinking and eating and sleeping poorly. 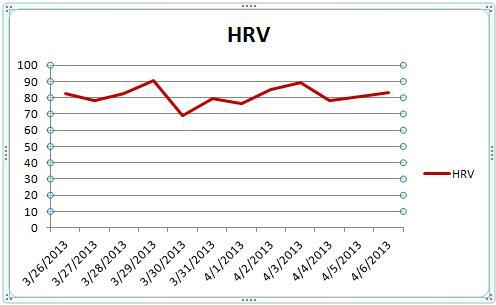 His HRV trend is significantly affected as a result. Performance, work capacity and perceived sleep quality are negatively affected upon his return and resumption of daily routine. 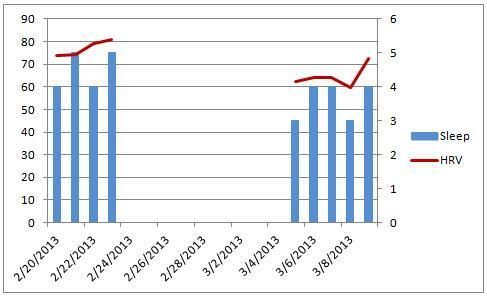 A significant reduction in training load was required. The athlete who vacationed with his family and maintained a reasonable eating and sleeping schedule while avoiding excessive daily alcohol consumption saw apparently no effect in his HRV trend. Training and daily routine resumed without effect. This entry was posted in Heart Rate Variability and tagged heart rate variability, HRV, monitoring, spring break, vacation. Bookmark the permalink. Reblogged this on Collins Strength and Conditioning.